Daniel James "Dany" Heatley (born January 21, 1981) is a German-born Canadian former professional ice hockey winger. Originally drafted by the Atlanta Thrashers second overall in the 2000 NHL Entry Draft, he won the Calder Memorial Trophy as the top NHL rookie in 2002. However, after being responsible for a car crash in September 2003 that killed teammate and close friend Dan Snyder, he requested a trade and was subsequently dealt to the Ottawa Senators. One of the Senators' perennial leading scorers during his tenure with Ottawa, Heatley set franchise records for single-season goals (50), which he achieved in back-to-back seasons in 2005–06 and 2006–07, and points (105), during the 2006–07 season. He played on the left wing with line mates Jason Spezza and Daniel Alfredsson. The line was consistently among the highest scoring in the NHL after its formation in the 2005–06 season, with the trio combining for a total of 296 points that season. At the end of the 2008–09 season, Heatley demanded a trade from the Senators. A deal was in place to send Heatley to the Edmonton Oilers on June 30, but Heatley refused to waive his no-trade clause. 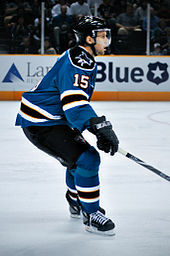 On September 12, he was dealt to the San Jose Sharks in return for Milan Michálek, Jonathan Cheechoo and a second-round draft pick in 2010. After playing two seasons in San Jose, he was traded to the Minnesota Wild in exchange for forward Martin Havlát, his former teammate with Ottawa. On July 9, 2014, Heatley signed a one-year deal as a free agent with the Anaheim Ducks worth $1 million. On December 29, 2014, a source confirmed that he had been placed on waivers. A day later, Heatley cleared waivers and was assigned to Anaheim's AHL affiliate, the Norfolk Admirals. On February 28, 2015, Heatley was traded to the Florida Panthers along with a third round pick in 2015 for Tomáš Fleischmann. Heatley most recently signed with the Thomas Sabo Ice Tigers of the Deutsche Eishockey Liga in September 2015. He was nicknamed "Heater", based on his name and scoring prowess. Heatley was born in Freiburg to Karin and Murray Heatley, where his father played professional hockey. When Murray retired from hockey, the family settled in Calgary, Alberta. Playing minor hockey in the Alberta Midget Hockey League (AMHL) for the Calgary Buffaloes, Heatley tallied 91 points in 36 games in 1997–98 to earn the Harry Allen Memorial Trophy as the league's top scorer. He went on to lead the Buffaloes to the bronze medal at the 1998 Air Canada Cup, where he finished as both Top Scorer and Tournament MVP. As Heatley intended to play college hockey in the United States, he joined the Junior A ranks in 1998–99 with the Calgary Canucks of the Alberta Junior Hockey League (AJHL) to maintain his NCAA eligibility (as opposed to playing major junior). Recording 70 goals and 126 points in 60 games, he was named AJHL and Canadian Junior A Player of the Year. The following season, he began his two-year tenure with the University of Wisconsin Badgers of the Western Collegiate Hockey Association (WCHA). As a freshman, he was named to the WCHA First All-Star Team and NCAA West Second All-American Team, in addition to earning WCHA Rookie of the Year honours. In the off-season, he was drafted second overall by the Atlanta Thrashers in the 2000 NHL Entry Draft, behind goaltender Rick DiPietro. After his sophomore year, in which he was named to the 2001 WCHA Second All-Star and NCAA West First All-American Teams, Heatley chose to forgo his final two years of college eligibility to turn pro with the Thrashers. Heatley made his NHL debut with the Thrashers in 2001–02, leading all rookies in points (67) and assists (41) and was second in goal-scoring (26) behind teammate Ilya Kovalchuk. He won the Calder Memorial Trophy for Rookie of the Year, for which Kovalchuk was also nominated. In the 2002–03 season, Heatley emerged as an NHL superstar. Finishing ninth in overall league scoring, Heatley tallied 41 goals and 89 points in 77 games, his best statistical season with the Thrashers. On September 29, 2003, Heatley was seriously injured after he lost control of the Ferrari 360 Modena he was driving. The car struck a wall, splitting the car in half and ejecting him and his passenger, teammate Dan Snyder. Heatley suffered a broken jaw, a minor concussion, a bruised lung and a bruised kidney, and he tore three ligaments in his right knee; Snyder was critically injured, with a skull fracture, and died six days later, on October 5, of sepsis. Heatley was charged with vehicular homicide; he pleaded guilty to second-degree vehicular homicide, driving too fast for conditions, failure to maintain a lane and speeding. He admitted to drinking prior to the incident, but his blood-alcohol content was below the legal limit. He was sentenced to three years probation, and the judge, Rowland W. Barnes, required the court to approve Heatley's vehicle, which could not have more than six cylinders and would not surpass 70 mph (112 km/h). Heatley avoided having to go to trial as part of a plea deal that dropped the first-degree charge of vehicular homicide. Because of injuries he suffered from the car crash, Heatley's season did not start until January 2004 and he appeared in only 31 games. A disappointing season ended with an early elimination in the race for a playoff spot and 25 points. During the last part of the season, the Thrashers and the Atlanta community, including Snyder's family, were largely supportive of him, including telling Atlanta prosecutors and the judge that nothing would be gained by imprisoning him. During the 2004–05 NHL lock-out, Heatley initially played for the Swiss team SC Bern. He played consistently well, scoring more than a point per game, until being injured in November when he required surgery for a broken orbital bone after being struck in the left eye with a puck. The pupil in his left eye became permanently dilated as a result. He finished the year with the All-Star-laden Ak Bars Kazan in the Russian Superleague (RSL), joining Thrashers teammate and friend Ilya Kovalchuk, among others, but had an unimpressive stint. Prior to the end of the lock-out, Heatley asked to be traded from Atlanta in hopes of leaving reminders of the tragic crash behind. This was unpopular with Atlanta fans, particularly as Snyder's father Graham noted that Heatley owed much to the Thrashers' organization that had particularly been extremely supportive of him during his trial and ordeal. On August 23, 2005, the Thrashers sent him to the Ottawa Senators for Slovak star Marián Hossa and veteran defenceman Greg de Vries. Hossa had just re-signed with the Senators after protracted and often contentious negotiations. A restricted free agent at the time of the trade, Heatley immediately signed a three-year, $13.5 million contract with the Senators. In his first game for the Senators, against the Toronto Maple Leafs on October 5, 2005, Heatley played with Jason Spezza and Brandon Bochenski, but when the Senators were down with five minutes to go, Daniel Alfredsson, who replaced Bochenski, scored the tying goal. As 2005–06 was the first year that the NHL implemented the shootout, Heatley became the second player to score in an NHL shootout, scoring against Leafs goalie Ed Belfour, after Alfredsson. Their sticks are now in the Hockey Hall of Fame. Later that month, on October 29, Heatley scored four consecutive goals in an 8–0 win over the Toronto Maple Leafs, marking a career high for goals in a game. Heatley made a spectacular start with his new team, registering points in the first 22 games of the 2005–06 season, breaking Marián Hossa's previous franchise record of 13 consecutive games. Among players with new teams, this was behind only Wayne Gretzky's 23-game streak upon joining the Los Angeles Kings during the 1988–89 season. In his first game back in Atlanta as a Senator, he was frequently booed, indicating that Thrashers fans felt snubbed by Heatley's previous trade request. Despite scoring, Heatley and the Senators suffered an 8–3 defeat to his former Thrashers teammates. 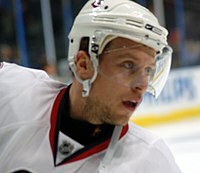 Heatley finished the 2005–06 season with 50 goals and 103 points, fourth in the league. Incidentally, Heatley's first 50-goal season also marked the first time any Senators player had achieved that mark, setting a franchise record for goals in a season (previously held by Marián Hossa, who scored 45 goals in 2002–03). Heatley's 103 points also tied Daniel Alfredsson for the team lead, together surpassing Alexei Yashin's franchise record of 94 points in a season (achieved in 1998–99). Catalyzed by a rejuvenated offence, Ottawa finished the season with the best record in the Eastern Conference and the second-best in the league. With lofty expectations for the playoffs, they were eliminated in the second round by the Buffalo Sabres. Heatley recorded 12 points in 10 games. At the end of the season, Heatley was selected, along with Alfredsson, to the Second All-Star Team. After a slow start to the 2006–07 season, Heatley recorded 50 goals once more (second in the league to Vincent Lecavalier's 52 goals) and 105 points (fourth in the league). By reaching the 50-goal plateau for the second straight season, he became the first NHL player to do so since Pavel Bure in 1999–2000. Heatley's 105 points broke the previous franchise record he shared with Alfredsson. His performance earned him a spot on the First All-Star Team. Heatley and the Senators followed up another strong regular season going all the way to the Stanley Cup finals, but finished short in five games against the Anaheim Ducks. The Alfredsson, Spezza and Heatley line was dominant, leading the NHL in playoffs points, all tied at 22. Fresh off the heels of a Stanley Cup finals appearance, Heatley began the 2007–08 season with a new six-year contract extension with the Senators worth $45 million, signed prior to the season opener against the Maple Leafs. Since arriving in Ottawa from the Marián Hossa trade, Heatley had appeared in 208 consecutive Senators games, until suffering a separated shoulder on January 12, 2008, in a collision with Detroit Red Wings forward Dallas Drake, sidelining him for 11 games. He completed the 2007–08 season with 41 goals and 41 assists for 82 points in 71 games. Ottawa was plagued with injuries to its superstars all season. Seeding seventh overall in the East, Ottawa met the Pittsburgh Penguins in the playoffs, coincidentally the same first-round match-up of the previous year. However, Heatley and the Senators would not make a second run for the Cup and were swept in four games. Heatley managed just one point. On October 3, 2008, Heatley was named alternate captain to Daniel Alfredsson, along with defenceman Chris Phillips. The 2008–09 season, however, was met with decreased production for Heatley and the top line as well as an 11th-place finish for the Senators in the Eastern Conference, well out of playoff contention. Coming off his lowest points total since his rookie season (excluding his shortened 31-game season in 2003–04), TSN reported that Heatley had filed a request for a trade on June 9, 2009, despite being only one year into a six-year contract extension signed in 2007. Heatley had reportedly become unhappy with his role with the Senators under new head coach Cory Clouston. Despite his declining offensive numbers, Heatley felt that his decreased ice time and his move from the first power-play line to the second power-play line were unfair to him. Prior to the trade request, these concerns had been addressed in the Senators' year-end meetings. In an interview with reporters, Senators' General Manager Bryan Murray stated that he was "shocked and disappointed" at the request. In addition, Murray stated that Clouston was hurt by Heatley's remarks. "The frustrating part for us is we have gone through several coaches here that we couldn't win enough games with," Murray stated. "We brought in a guy the results we were very happy with. The team started to look like a real team again. And then to be kind of blindsided, in his way of thinking anyway, by one of your players – not wanting to fit in. That's hard for a coach to accept." Trading Heatley was made more challenging due to his large contract, a contract that was to pay him approximately $7.6 million for the upcoming 2009–10 season, with few other teams having the available salary cap space to accommodate. A deal was in place to send Heatley to the Edmonton Oilers in exchange for Andrew Cogliano, Dustin Penner and Ladislav Šmíd on June 30, 2009, but Heatley refused to waive his no-trade clause, further angering fans in both Ottawa and Edmonton. NHL Deputy Commissioner Bill Daly suggested that the Senators may have grounds to file a grievance, as Heatley's contract stipulated the team pay a bonus (due July 1, 2009) of US$4 million. The Edmonton trade would have spared the Senators that expense. On September 12, 2009, Heatley was traded to the San Jose Sharks, along with a fifth-round pick in 2010, for Milan Michálek, Jonathan Cheechoo and a second-round pick in 2010. Heatley made $8 million that year. In the Sharks' fourth game of the season, their home opener against the Columbus Blue Jackets and Heatley's first game in front of the San Jose fans, Heatley capped a hat-trick with a penalty shot goal in the third period, bringing his season totals to four goals and five assists (nine points) in the first four games of the season. On November 20, Heatley recorded his second hat-trick in as many months, as he scored three times from passes from teammate Joe Thornton in a 6–3 win against the Philadelphia Flyers. The Sharks were eliminated in the 2010 Conference Finals as, with Dany Heatley in the penalty box, the Chicago Blackhawks scored the game-winning goal, sweeping the series. However, Head Coach Todd McLellan revealed that Heatley had been playing the entire playoffs with a torn groin muscle. On December 2, 2010, in his first return to Ottawa, Heatley was frequently booed. The Sharks won the game 4–0, and Heatley had an assist. In the following season, Heatley put up the worst full-season point totals of his career, registering only 26 goals and 64 points in 80 games. After the season had concluded, it was revealed that Heatley had been battling multiple injuries during the season, and especially during the playoffs. On July 3, 2011, Heatley was traded to the Minnesota Wild for Martin Havlát. There he joined former teammate Devin Setoguchi who had also been traded by the Sharks to the Wild on June 24, ten days before him. While producing a solid season, scoring 53 points, the Wild ultimately failed to reach the playoffs despite a hot start to the year. On February 9, 2012, Heatley recorded the fastest goal in Wild history, scoring 13 seconds into a game against the Vancouver Canucks. In the lock-out-shortened 2012–13 season, Heatley recorded 11 goals and 10 assists in 36 games with Minnesota. However, during a game against the San Jose Sharks in April, an altercation with former teammate Marc-Édouard Vlasic dislocated Heatley's left shoulder, requiring surgery that ended his season. The 2013–14 season saw Heatley's production decline dramatically, as he recorded only nine goals and 19 points in his first 55 games. Approaching unrestricted free agency, speculation began that his NHL career might be over and that he might move to Europe to continue his hockey career. Though he showed glimpses of his former abilities (registering seven points in one ten-game stretch) by the 74-game mark of the season, he had recorded only 27 points. On March 29, 2014, Heatley was a healthy scratch for the first time in his career after being demoted to the fourth line for several games. On July 9, 2014, Heatley signed a one-year deal as a free agent with the Anaheim Ducks worth $1 million. He was a healthy scratch after four games with no points. On December 11, 2014, Heatley was assigned to the Ducks' American Hockey League (AHL) affiliate, the Norfolk Admirals. On December 29, 2014, he was placed on waivers. On February 28, 2015, Heatley was traded to the Florida Panthers along with a 2016 third-round draft choice for Tomáš Fleischmann. He finished his tenure with the Ducks with no points in 6 games, but recorded 7 in 25 games with Norfolk. Heatley signed with German club, the Thomas Sabo Ice Tigers of the Deutsche Eishockey Liga (DEL) on September 17, 2015. He reached the DEL playoff-semifinals with the Ice Tigers, where they fell short to the Grizzlys Wolfsburg. Heatley played a total of 59 games in the 2015–16 season, tallying 19 goals (including the Ice Tigers' final goal of the season) and 18 assists. Heatley has been voted into the NHL All-Star Game five times, and played in four of them, most recently in 2009. His first appearance in the All-Star Game was in 2003, where he scored four goals, tying a single-game All-Star record (held by four other players, including Wayne Gretzky). The game went to a shootout where Heatley scored the only goal for the Eastern Conference in a 6–5 loss. The shootout goal did not, however, count towards his regulation total of four, leaving him tied for the record. Heatley also added an assist for a game-high five points and was named the All-Star Game MVP. In response to Heatley's impressive performance in just his second NHL season, Eastern Conference teammate Jeremy Roenick commented, "Twenty-two years old? You're not supposed to be able to pull moves like that at 22. My goodness." Heatley's next appearance came in 2007, where he played on a line with former SC Bern teammates Daniel Brière and Marián Hossa and got a goal and two assists in a 12–9 loss to the Western Conference. Heatley was selected for the 2008, but had to withdraw due to a shoulder injury he suffered in an earlier game against the Detroit Red Wings. Heatley was selected to his fourth All-Star Game in 2009 and scored a goal in a 12–11 Eastern Conference win in a shootout. Heatley competed in two World Junior Championships during his two-year career at the University of Wisconsin. His first, in 2000, ended with a bronze medal win against the US in a shootout; Heatley scored a goal in the 4–3 victory. The next year, in 2001, Heatley scored three goals and five points as Canada won a second-straight bronze. Heatley made his senior international debut with Team Canada at the 2002 World Championships, after his rookie season with the Atlanta Thrashers. He scored four points as Canada was defeated in the quarter-finals by Slovakia. The following year, Heatley led Team Canada in scoring (seven goals and ten points) at the 2003 World Championships in Finland, en route to his first gold medal. Having missed the playoffs once more with the Thrashers, Heatley participated in the 2004 World Championships in the Czech Republic. Heatley dominated with 11 points to lead all tournament scorers, earning his second-straight MVP award. Canada captured a second-straight gold medal, defeating Sweden 5–3 in the final. Heatley scored his eighth goal of the tournament in the third period, starting a rally from a 3–1 deficit. Several months later, Heatley competed in the 2004 World Cup and contributed two assists as Canada defeated Finland in the final to capture the second-ever World Cup championship. At the 2005 World Championships in Austria, his fourth-straight World Championships, Heatley did not achieve the same success, with seven points in nine games, as Canada was shut-out by the Czech Republic in the gold medal game. On December 21, 2005, Heatley was chosen by Team Canada to participate in the 2006 Winter Olympics in Turin – his first Olympic games. Heatley managed three points in six games as Canada, defending its 2002 gold medal, was eliminated in the quarter-finals by Russia. As Heatley returned to the World Championships after a three-year absence in 2008 – he was added to the roster with teammate Jason Spezza after the Ottawa Senators were eliminated from the playoffs – he became Team Canada's all-time goal-scorer and then all-time point leader for the World Championships, passing Marcel Dionne and Steve Yzerman, accordingly. Heatley finished the tournament with a staggering 12 goals and eight assists in nine games, however, Canada was defeated by Russia in overtime of the gold medal game. Heatley was given MVP, Best Forward and All-Star Team honours. In the summer of 2009, Heatley was invited to Team Canada's Olympic tryout camp in Calgary, where he was booed on the ice by fans. On December 30, 2009, Heatley was selected to play for Team Canada at the 2010 Winter Olympics. Heatley helped lead Team Canada to an 8–0 win in the first game of the 2010 Olympic tournament by scoring two goals. On February 28, 2010, the team defeated the United States to win Canada's eighth gold medal in Olympic men's hockey. Dany Heatley holds dual Canadian-German citizenship because his mother is German. In August 2012, it was revealed that Heatley had filed an $11 million lawsuit against his longtime agent and business adviser Stacey McAlpine, McAlpine's parents Gerald and Eugenia, and several companies. The suit, filed in the Calgary Court of Queen's Bench of Alberta, alleges that the defendants lured Heatley into several real estate ventures across Canada and the United States with promises of huge returns that never materialized. It is also alleged that Stacey McAlpine made unauthorized withdrawals of more than $4 million from Heatley's bank accounts. The defendant companies named in court documents are Presidential Suites Inc., Waterfront Development Inc., McAlpine Sports Management Inc., and NSEM Management Inc.
One month later, it was revealed that Heatley's former Senators teammate Chris Phillips was also initiating a $7.5 million suit against Stacey McAlpine to recover lost money as a result of bad real estate deals. The suit, launched at the Ontario court in Ottawa, alleges Phillips felt he was misled by McAlpine and has not been able to recover monies invested. After a lengthy court process, Heatley was awarded $6.5 million from a judge in Calgary, Alberta on July 21, 2017. McAlpine was later arrested and charged with fraud, money laundering and theft by authorities in Winnipeg, Manitoba, Canada, on October 18, 2017. Heatley was selected as the cover player for the 2004 instalment of the EA Sports NHL video game franchise in 2003 (NHL 2004). However, due to the fallout from Heatley's crash shortly afterwards, EA switched the cover photo to Joe Sakic, although many copies of the game were shipped with his photo on them. ^ "Dany Heatley avoids jail time". CBC News. 2005-02-04. Retrieved 2018-01-23. ^ a b c d "Dany Heatley:Cheap and Pathetic". The Vancouver Sun. 2009-07-01. Archived from the original on 2009-07-05. Retrieved 2009-07-10. ^ "Sens deal Heatley to Sharks for Michalek, Cheechoo". The Sports Network. 2009-09-12. Retrieved 2009-09-12. ^ a b "AP Source: Ducks place Heatley on waivers". Associated Press. 2014-12-29. Retrieved 2014-12-29. ^ "Panthers trade Fleischmann to Ducks for Heatley, pick". NHL.com. 2015-02-28. Retrieved 2015-02-28. ^ "Dany Heatley heads to Germany, signs 1-year deal with Thomas Sabo Ice Tigers". Yahoo! Sports. 2015-09-17. Retrieved 2015-09-17. ^ "Greatness, Murder, and the Last Days: Dany Heatley's Rise and Fall from NHL Stardom". Sports. 2015-02-05. Retrieved 2017-11-01. ^ "What's In A Name?". NHL.com. Retrieved 2017-11-01. ^ "Dropping the puck: Wings vs. Sharks". FOX Sports. 2010-04-29. Retrieved 2017-11-01. ^ "Harry Allen Memorial Trophy - Top Scorer". Alberta Midget Hockey League. Archived from the original on 2012-07-19. Retrieved 2009-03-25. ^ "Felony charge dropped for Thrashers star's plea". ESPN. ESPN. 2005-02-04. Retrieved 2008-12-04. ^ a b Diamos, Jason (2005-08-24). "Thrashers trade Heatley to Senators for Hossa". New York Times. Retrieved 2008-09-29. ^ "Is playing without a visor worth the risk?". ESPN. Retrieved 2008-09-29. ^ "Ottawa trims Toronto as NHL inaugurates the shootout". USA Today. 2005-10-05. Retrieved 2008-09-29. ^ "Heatley scores four in a row; Senators embarrass Leafs". The San Diego Union-Tribune. 2005-10-29. Retrieved 2008-09-29. ^ "Hot Alfredsson, Hasek wipe out Isles". Sporting News. Archived from the original on 2009-02-11. Retrieved 2008-09-29. ^ "Blackhawks send Senators to second straight loss". USA Today. 2007-12-22. Retrieved 2008-09-29. ^ Garrioch, Bruce. "Thrasher fans blast 'jerk' Heatley". CANOE Sports. Retrieved 2008-05-22. ^ "Heatley, Senators singe Thrashers". Sporting News. Archived from the original on February 11, 2009. Retrieved 2008-09-29. ^ "Montreal tops Ottawa as win streak continues". USA Today. 2006-04-07. Retrieved 2008-09-29. ^ "Senators' coach: Heatley's best yet to come". Sporting News. 2007-04-22. Archived from the original on 2009-02-11. Retrieved 2008-09-29. ^ "Bulletin: Senators and Heatley Reach Agreement". Archived from the original on 2007-10-12. Retrieved 2007-10-03. ^ "Heatley out 4–6 weeks with shoulder injury". 2008-01-13. Archived from the original on 2008-01-16. Retrieved 2008-01-13. ^ "Hartsburg gives Heatley an A". Ottawa Citizen. 2008-10-03. Archived from the original on 2009-02-02. Retrieved 2008-10-03. ^ a b "Bulletin: Heatley asks Senators for trade". The Sports Network. 2009-06-10. Retrieved 2009-06-16. ^ "Trading Heatley an enormous job for Sens' GM Murray". The Sports Network. 2009-06-16. Retrieved 2009-06-16. ^ By Associated Press, San Jose Mercury News. "Heatley joins Sharks." September 18, 2009. ^ "Dany Heatley welcomes trade to Minnesota, ready to become Wild's go-to scorer". NHL.com. Retrieved 2014-03-15. ^ "2011-12 Minnesota Wild Roster and Statistics". Hockey-Reference.com. Retrieved 2014-03-15. ^ "Report: Minnesota Wild's Dany Heatley to have shoulder surgery - NHL.com - News". NHL.com. Retrieved 2014-03-15. ^ "Wild gets big win in Columbus; Dany Heatley to undergo shoulder surgery | Russo's Rants". StarTribune.com. Retrieved 2014-03-15. ^ a b Fox, Luke (November 11, 2013). "NHL rumours: Why no one wants Heatley". Sportsnet. Retrieved November 11, 2013. ^ "Dany Heatley signs with Anaheim Ducks - NHL Free Agency 2014". NHL.com. 2014-07-09. ^ "DEL schedule and statistics". Deutsche Eishockey Liga. 2016-05-21. Retrieved 2016-05-21. ^ "Atlanta's Heatley named MVP after record-tying effort". CNNSI.com. 2003-02-03. Retrieved 2008-05-22. ^ Snow, Chris (2004-02-05). "Rebuilding a life". Minneapolis Star-Tribune. ^ "Bruins' Savard chosen to replace injured Heatley in All-Star Game". ESPN. Associated Press. 2008. Retrieved 2008-04-25. ^ "Czechs claim gold; Canada beats USA". USA Today. 2000-01-04. Retrieved 2008-10-03. ^ Bulman, Erica (2004-05-10). "Canada beats Sweden for gold". Seattle Times. Retrieved 2008-10-03. ^ "Dany Heatley: hard road to Turin". CBC. Retrieved 2018-01-22. ^ "Heatley scores three as Canada dominates Slovenia 5-1". 2008-05-02. Archived from the original on 2012-10-05. Retrieved 2008-05-06. ^ "Hockey Canada: Heatley moves past Yzerman to become all-time points leader for Canada". 2008-05-04. Retrieved 2008-05-06. ^ Kanalley, Craig (2009-12-30). "Canadian Olympic Hockey Team: 2010 Roster Released". The Huffington Post. Retrieved 2009-12-30. ^ Zupke, Curtis (2010-02-16). "Getzlaf, Perry score in Canada's 8-0 victory". Orange County Register. Archived from the original on 2010-02-19. Retrieved 2010-02-16. ^ The Canadian Press (2010-03-01). "Hockey remains Canada's game". CBC Sports. Retrieved 2018-01-23. ^ "Transfer Coup: Dany Heatley in DEL with Thomas Sabo" (in German). badische-zeitung.de. 2015-09-16. Retrieved 2015-09-16. ^ "Minnesota Wild star Dany Heatley sues ex-agent, others for $11-million". The Globe and Mail. 2012-08-13. Retrieved 2012-08-13. ^ "Phillips joins Heatley, suing former agent". Ottawa Sun. 2012-09-13. Retrieved 2018-01-23. ^ "Dany Heatley wins $6.5 million suing former agent". Yahoo! Sports. 2017-07-21. Retrieved 2017-07-21. ^ "NHL player agent accused of defrauding Dany Heatley, Chris Phillips of $12 million". Canadian Broadcasting Corporation. 2017-10-18. Retrieved 2017-10-18. ^ "EA Sports Replaces Heatley With Sakic On "NHL 2004" Cover". sportsbusinessdaily.com. December 2, 2003. Retrieved July 12, 2018.